Few ideas make less sense than combining a hybrid drivetrain with a 5,688-lb, V-8-powered SUV. 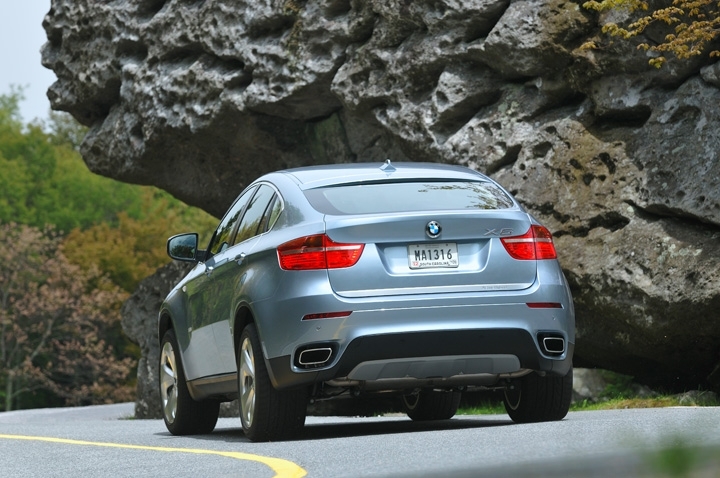 Yet here we are, with the 2010 BMW ActiveHybrid X6. BMW says it chose the X6 platform as its first full hybrid to maximize fuel economy gain (they’ve reduced consumption by 20 percent). Yet the ActiveHybrid X6 is the most powerful hybrid ever made, with a 400 horsepower twin-turbocharged engine and electric motors combining to produce 480 horsepower and 575 lb-ft of torque. It can race to 60 mph in 5.4 seconds – just 0.1 second slower than the X6 xDrive50i on which it’s based – and delivers power to the four wheels via a seven-speed automatic transmission. It is, in short, a monster. But it feels like a Frankenstein; the individual bits are first-rate, but the result is faulty. The drive, while stellar is certain areas, is compromised because of the hybrid system, and all that power equates to a miniscule bump in fuel economy. 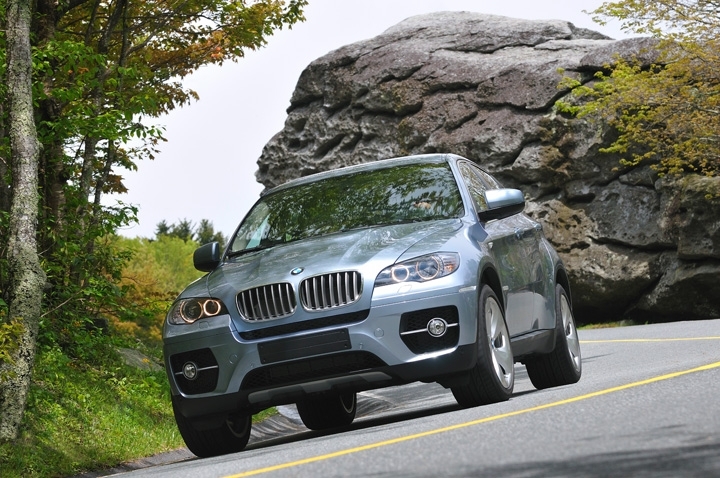 Certainly it’s not enough to warrant the $22,000 premium over the X6 xDrive50i. Granted, there are a slew of standard features that range from butter-soft leather seats to a stunningly powerful surround-sound audio system, and the luscious color combination of Bluewater exterior paint and cream/black two-toned interior is exclusive to the hybrid, but it’s just not enough. If the point of creating hybrids is to make the future a better place, then BMW just took us two steps into the past. The engine, the main reason for liking the original X6, is superb, and driving dynamics remain on top form despite the weight of the vehicle (400 pounds heavier with the hybrid components). The interior stands as one of the best SUV interiors we’ve ever seen, with soft leathers, ergonomically perfect seats and an elegant instrument panel to enjoy at your leisure. Trunk space hasn’t been compromised in the least by the large battery. 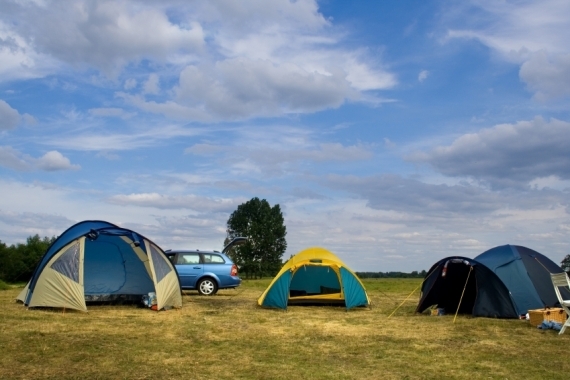 The starting price – and ending price given its all-inclusive nature – is severely prohibitive. Few people will want to throw down this kind of money for the minor fuel consumption reduction the ActiveHybrid X6 delivers. The hybrid system interferes with some of the fine drive qualities, especially the regenerative brakes and sluggish switchover from electric to combustion engine power. The two-mode hybrid system allows the X6 to cruise up to 37 mph on electric power alone, only switching to engine power if the driver depresses the throttle forcefully. We noticed sluggish response when attempting to accelerate rapidly, as if the system was having trouble coordinating all the components, and the regenerative brakes feel as though you’re trying to reach the engagement point through a large, gooey marshmallow. Nevertheless, handling is superb and power output seems inexhaustible when the V-8 is motivating the car, surprising traits in a vehicle that looks this ungainly and weighs nearly three-tons. Wind noise was surprisingly an issue in our European-spec tester and C-pillar blind spots are unavoidable, though the ride overall was a subdued and comfortable affair, especially with the excellent damping and body-hugging seats. 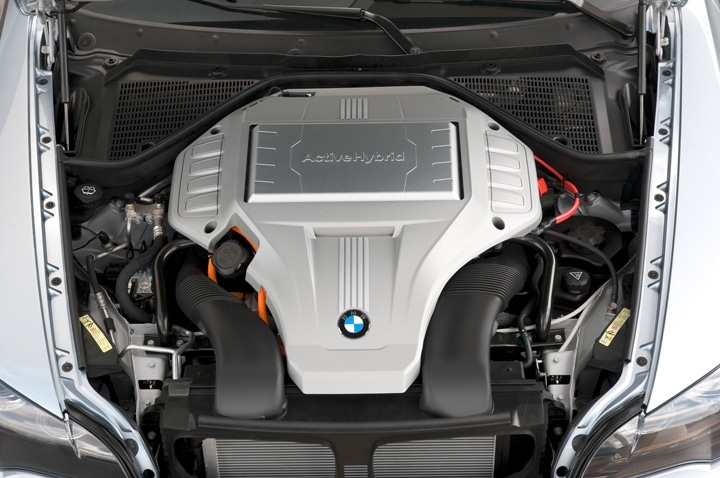 In addition to the two-mode hybrid system, which adds 85 extra horsepower and 125 lb-ft of torque, the X6 is powered by a twin-turbocharged V-8 engine that churns out 400 horsepower and 450 lb-ft of torque. Total power output is 480 horsepower and 575 lb-ft of torque. 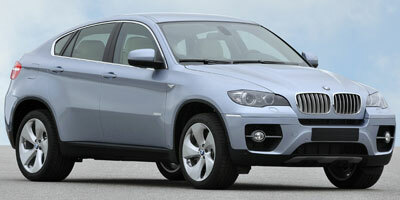 BMW’s xDrive all-wheel drive system is standard, as is the seven-speed automatic transmission with manual mode. 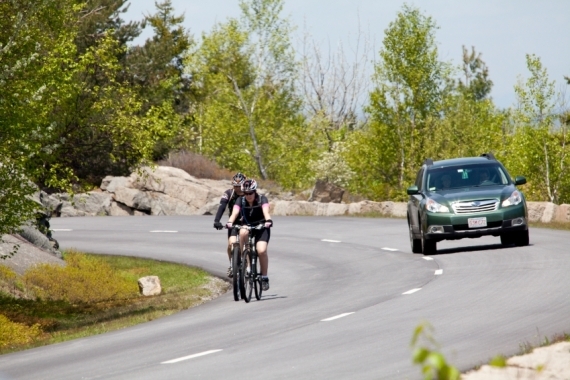 What doesn’t the ActiveHybrid X6 have standard? A useful heads-up display, Bluetooth connectivity, surround-sound audio, suede headliners, two USB ports and heated seats are just a few items in the laundry list of impressive features. 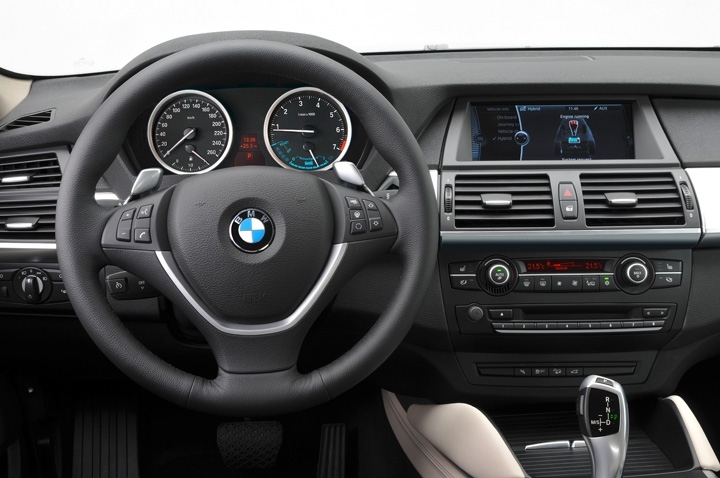 The navigation system, controlled by iDrive, is also standard and features real-time traffic. The ActiveHybrid X6 utilizes a two-mode hybrid system developed in conjunction with General Motors and the former DaimlerChrysler. In this system, an electric continuously variable transmission (ECVT) distributes power through two different drive modes; one is used during stop-and-go driving and the other when driving at higher speeds. While in the first mode, just one of the two electric motors is used as the vehicle’s sole power source, but the second kicks in to activate the engine when more power is needed, and acts as a generator to recharge the nickel-metal hydride battery during regenerative braking. Here’s where things get ugly. The point of a hybrid is to dramatically decrease fuel consumption for the regular models, but the ActiveHybrid X6 gets just 17 mpg around the city and 19 mpg highway – up from 12/18 in the xDrive50i. A small bump like that won’t inspire much love, despite the 20 percent reduction in consumption and ULEV-II EPA rating. With an interior nothing short of gorgeous, the X6 delivers luxury in every seat (though watch out in the two rear seats, you’ll have to be under six feet tall to enjoy the space). A two-tone, cream leather and black trim-accented cabin has well placed controls and generous front passenger space. The tachometer houses a battery level indicator and a ‘ready’ notification for the hybrid system as well. Like it or leave it, the X6 has a very distinct exterior shape that could be most accurately described as a large four-door coupe (a conundrum in itself) paired with a compact SUV. Anyone else confused? To accommodate the larger engine/hybrid system, a ‘Power dome’ – or raised bulge – has been added to the hood. Custom to the hybrid body are aerodynamic wheels, subtle ActiveHybrid badging and Bluewater exterior paint. When BMW came out with the X6 last year, they essentially created a new segment. They’ve done it again with the hybrid X6. It commands a $22,000 premium over the original though, coming in at $89,725 (including destination and handling). While there are no direct competitors, two upcoming models, the Mercedes-Benz ML450 HYBRID and Porsche Cayenne Hybrid ($60,000 est.) will fill the void. BMW does seem to be serious about making efficient vehicles, but their latest effort seems to have an unclear purpose. The ActiveHybrid X6, with both a powerful V-8 and a hybrid system, is a study in contradictions, and the resulting increase in fuel economy won’t be enough to persuade many to swallow that $22K premium over the X6 xDrive50i, no matter how much they like the Bluewater paint.